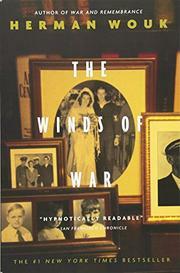 This endlessly effluent, Woukmanlike novel which runs to almost 900 pages deals with a typical American family before World War II and up to Pearl Harbor and it is conveniently mapped from Washington to Berlin to Warsaw (the siege) and London (the blitz) and Moscow and Rome and points elsewhere. Real people appear. Churchill and Attlee and F.D.R. who calls our hero, Naval Commander Victor Henry, by his sobriquet Pug and will be heard saying "Good night, old top." In the beginning Wouk almost seems to be competing with Shirer -- following not only Hitler's rise to power but explicating its mystique back to the Huns' earlier destruction of Imperial Rome via Hegel and Heine and one character here. His Commander Henry, however, a too hard working (cf. his wife Rhoda), good and considered man, restricts himself to the comment "I don't admire their treatment of the Jews" when he is Naval Attache in Berlin. The Henrys are solid middle-class Methodists and wouldn't go that far -- but then they also don't quite like the fact that their son, Byron, has fallen in love with Jewish Natalie Jastrow, niece of the great scholar and author of A Jew's Jesus who lives a Berensonian existence in Siena. Eventually though she has finally married Byron, has had his child, and will be trapped in Italy with her uncle. Then there are the two other Henry children -- and Rhoda's mid-marriage adultery -- and a good many other characters none of whom seem very alive but then you're never close enough to pinch them and find out. All of it is written in Wouk's solid wearever prose which is not to underestimate the book's happily-or-unhappily ever after ongoing readability for all those faces in the crowd, ours and theirs -- those with a lot of stickwhittling time on their hands.